Delocalization is the spreading of a charge or lone pair electrons over the molecule. See, resonance hybrid. The easiest way to understand delocalization is by understanding electronic conduction. Electrons that are usually in an ion, or solid metal that is not associated with an atom or a covalent bond. The electric charge is spread out in an atom or spread out in several atoms that have bonded together. Metals, for example, are conductors because the electrons are spread out to the outer part of the atom (delocalized). Since the electrons are not bound to the nucleus of the atom and are free to move around it, they become more susceptible to electrical charges or reactions. 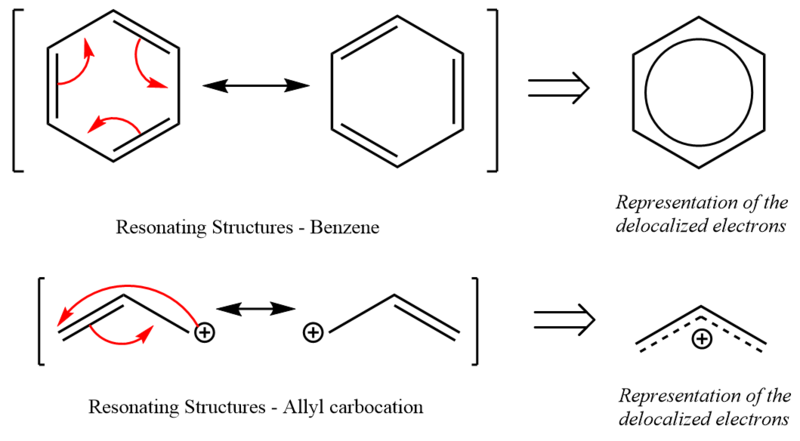 In organic chemistry, we understand delocalization via the resonating structures of the molecule. The pi bond electrons delocalize over the entire structure. Notice the movement in the diagram.